Blue Water Farms is located in Davie, Florida – west of Fort Lauderdale and forty-five minutes south of Wellington. We are a full service boarding facility that offers lessons in Equitation, Hunter, Jumper and Dressage. Blue Water Farms also operates a prominent riding camp for children between the ages of 6 and 17. Here at Blue Water Farms, our passion is horses. You will feel it the moment you drive through our gates. With twenty-five beautifully manicured acres and lush grassy paddocks you will agree that our facility is second to none. We are very unique to the industry because we provide top trainers and instruction while creating a supportive and fun environment. Blue Water Farms offer clinics and seminars with top international and national clinicians and trainers. Our farm hosts local and rated shows throughout the year. 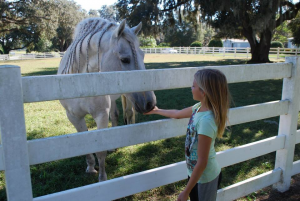 Clinics and seminars are offered with or without sleeping accommodations for riders and horses at our Ocala location. We are a family oriented farm that is equally inspired by the majestic beauty and spirit of horses, and the playful youth of our riders. Whether you are an adult or a child, if you share our passion for horsemanship you will gain experience and memories that will last a lifetime. Come be a part of the Blue Water Farms’s family.